Good morning friends and happy Monday. Yes, I'm finally back to my Happy Homemaker Monday, I apologize for the lack in posts the past few weeks. It's been a busy weekend but I'm ready to tackle on the new week and see what is ahead, are you? Sitting down with a good book and relaxing. I need to go grocery shopping today so don't really have anything planned yet, have to work on the menu and the grocery list this morning. I do have some chicken thighs and I may put them in the crockpot for dinner. Have so many shows to catch up on, with not having internet for a while everything has been put on hold and now I am ready to sit down and crack on. I do love my shows and I watch them while doing house chores so it helps the time pass quicker. Actually sitting in bed at the moment, typing up this post. I have my curtains and blinds open and the sun is coming in and washing the bedroom in a beautiful golden light. Early morning is my favorite time of day. I have a bunch of recipes I am going to be trying out, now that I'm back to cooking full time. I will have them on the food blog as I make them. Finally picked up my crochet again, I've missed it so much. I currently have a stripey cushion on the hook. I already have one but wanted to make another for the living room. Finishing up my house, unpacking the last few boxes and really getting back into a normal routine for our family. We've been so rushed and so busy lately that it's just getting a little tiring to be honest, so I'm ready to just stop, take a breath and relax. When moving to a new State, look at it as a fun adventure and not a scary change in your life. Take a look around, research your new area online, take a drive and see what the locals have to say, you'll be surprised at the fun things you can find out. Nothing yet, haven't started reading the blogs and replying to anyone, hoping to start again this week. That life is so short and that time flies by at the blink of an eye. Having been away from all family for so many years and then seeing everyone again, makes you realize just how things change. At the moment I would say the kid's schooling. Trying to get them enrolled for the next year and still juggling the whole Texas Connections thing. Just want to get it all taken care of finalized so that I can really relax and enjoy the rest of summer. Lord, be gracious to us; we long for you. Be our strength every morning, our salvation in time of distress. Looks like a full week for you. My lesson learned this past weekend was, don't wear flip flops in the chicken coop, ha ha! Welcome back! Can't wait to see your catch up posts. I don't envy your heat - yowzers!! I totally agree with the humidity thing too. Looking forward to your posts and recipes ahead!! 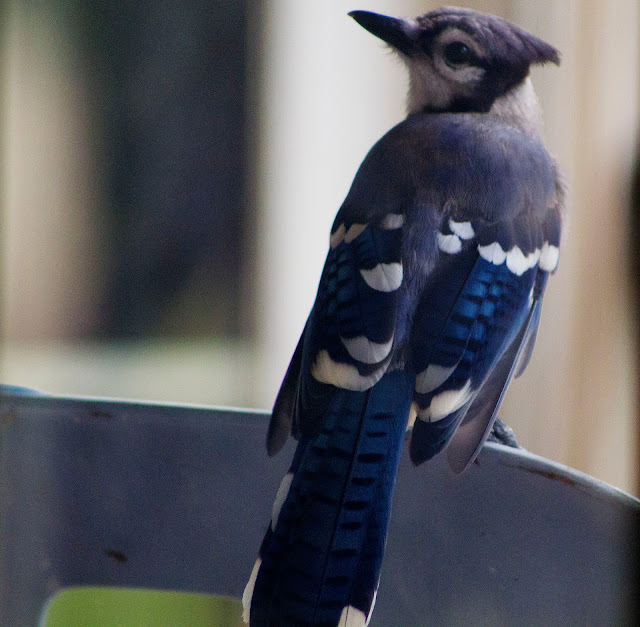 Love the blue jay photo - so pretty. How nice to be closer to family again! Hope you are able to work out all the home school stuff so that it can really feel like summer. I remember that feeling well from when I was home schooled back in high school! Glad to see you back on-line! Love the Bluejay picture. Hope you continue to get settled in your new home and have a great week! Hi Sandra! I started Happy Homemaker while you were moving and settling, so I guess this is the first time I've officially linked up...Looks like your settling in! But phew! Too warm for this Maine girl! Where's the 70s? LOL Beautiful blue jay! I just helped along a Hermit Thrush today that flew into a window and stunned itself. 30 minutes later she was off again!